Saturday, May 18, 1 - 3 p.m. The Tipsy Tea and Purse Party is a way to come together at a themed party to have fun and purchase new or upcycled purses, or to just have fun and enjoy good food and company. Your ticket includes a variety of teas, 1 adult cocktail, and a luncheon featuring delicious finger sandwiches and desserts. 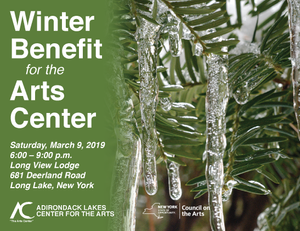 Please purchase tickets ahead of time by contacting Christine Pouch at christine@adirondackarts.org, by calling 518-352-7715, or by ordering online through the following link. Thank you to all of our members and supporters who attended the Arts Center's Annual Winter Benefit on March 9, 2019. We are so fortunate to have such a generous and dedicated community that continues to support the Arts Center year after year. We also want to thank our hosts, the Hosley family and staff at the Long View Lodge! Stay tuned for information on our next Summer Benefit!